Hope everyone had a great holiday weekend (Merry Christmas and Happy Hannukah!). I had a wonderful time with the family in Michigan, spending time with my aunt and uncle and our longtime family friends. I ate a ridiculous quantity of food (it's tradition!) 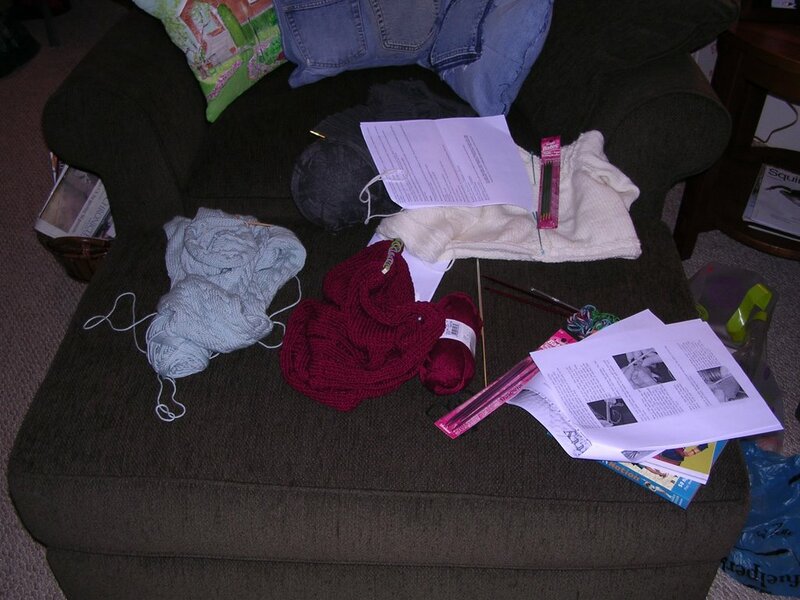 and got in a lot of good solid knitting time (10 hours in the car, plus time sitting around). I finished J's sock #1 and got a few inches done on my French Market Bag. 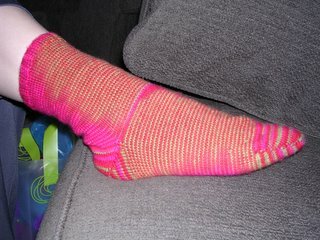 I cast on for sock #2 last night; I'll post pictures when both are done and blocked. Now that the holidays are over/started and I've given the handmade gifts, I can finally post pictures of these FOs. 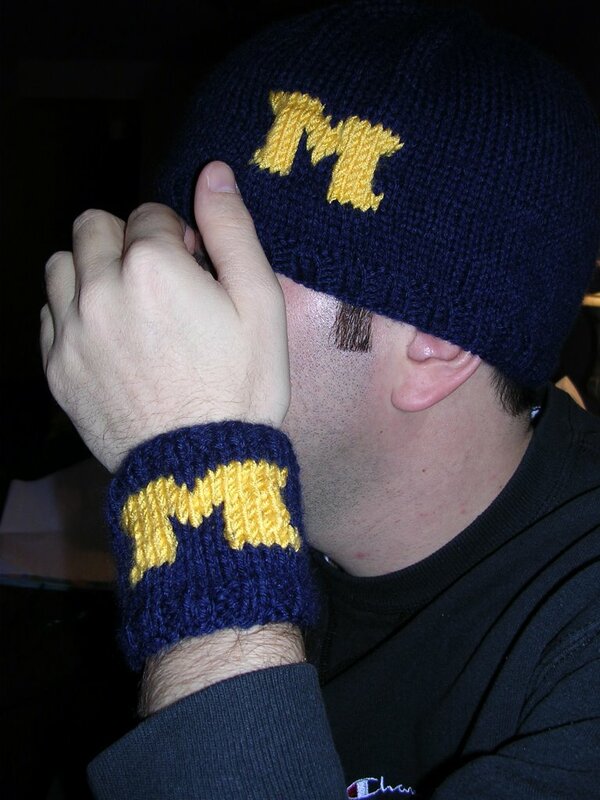 This was my first foray into intarsia (and as you can probably tell, the wristband, the second item knit of the two, was more successful). The blue is Lion's Brand Wool Ease, and the maize (not yellow!) 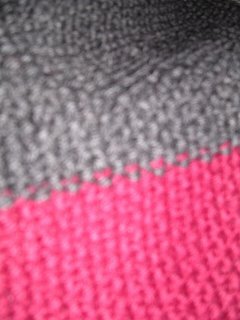 is Lion's Brand Micro Spun, doubled, because I could not find Wool Ease in anything close to the right color. J is modeling the items here before I wrapped them up to give to my brother last night. They were a big hit, and I think he'll actually wear them! That's a big deal, considering his usual disdain for my knitting. Finally, I have to close with a little note about how much fun I had at the knitting meet-up last week meeting Jen, Jane, and the other ladies. I'm glad to hear that Jen's mom is feeling better -- probably because she is the lucky recipient of the beautiful pink scarf she was working on that night! 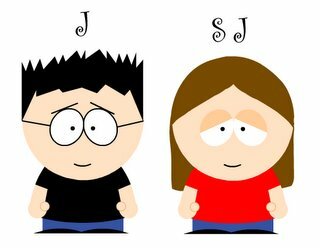 For those of you who religiously read Grumperina's knitblog as I do, you no doubt saw yesterday's post posing the question of who to tell about knitting blogs and whether or not we fellow knitbloggers have told our family about them. I've been thinking about this question all morning and thought I'd just throw my two cents in. Mom: What exactly is a blog? So those are my thoughts. Any feedback or comments are welcomed. Looking forward to knitting meet up tonight! The stripes are not cooperating as much as I'd like (probably because this sock is wider than the original I cast on -- twice -- before I frogged and started from scratch). J is very excited about them, however, even though they won't be a surprise anymore. 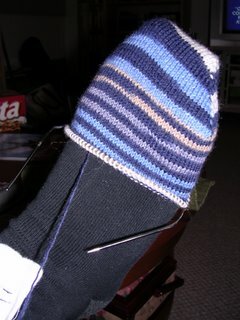 I'm hoping to finish up this sock before I leave with the family for Christmas weekend in Michigan on Saturday. Hoping to take J Sock #2 and probably my French Market Bag for all those hours of good car knitting (and also praying it's not so cold that my poor little fingers freeze up!) On the agenda tonight is sewing my "hanger" into the mini-sweater ornament and then go crazy with sock #1. I'm planning on going to my first knitting meet up tomorrow (and hopefully meeting Jen!) and want some good stuff to show off. All that's left to do is either find and buy or make a miniature hanger and sew it in. 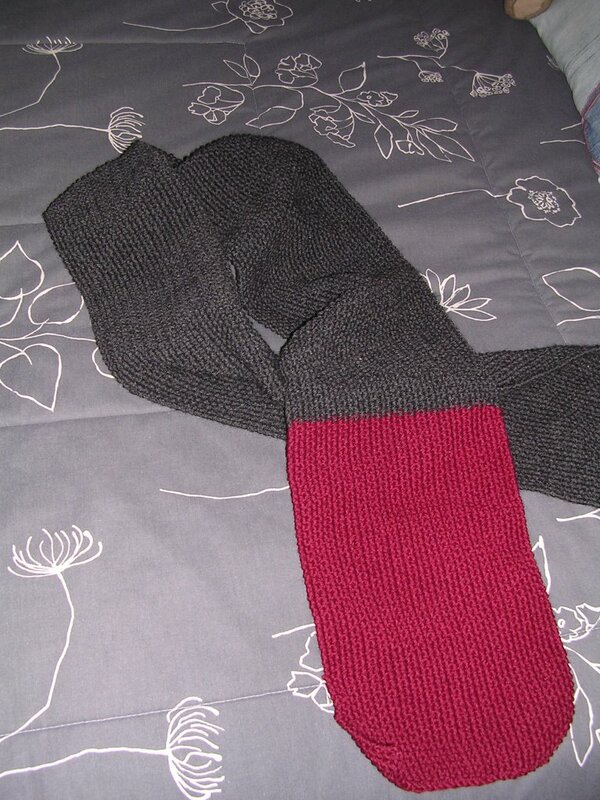 This was knit from some leftover Regia sock yarn and US 2 dpns. I blocked it overnight to get the sleeves to point downwards a bit (they originally stuck straight out). This is a modified version of the Umbilical Cord Hat from SnB (I made it bigger to fit a two-year-old). It's going to a little boy named Elijah, whose "stocking" I picked from my office gift drive for disadvantaged children at a local children's community center. I bought him some toys as well, but I always like to stick in something functional. 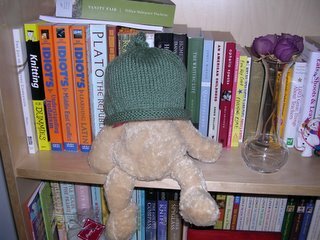 The hat is here being modeled by Pomegranite Peach Teddy---he came with a shampoo/conditioner package in said fragrance---on one of my four bookshelves in my living room (have I mentioned that I like to read?) Not only was this a quick knitting fix, but it also used up some of my acrylic stash! This particular color was left over from an afghan I crocheted last year. 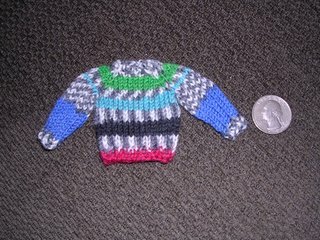 Tonight I'm going to try to do a mini sweater ornament to take to our family friends' house in Michigan for Christmas. I've made them an ornament (usually embroidered) every year we've gone there. Last year's ornament was a miniature stocking/sock. This is our last year going to their house (they're moving to the DC area soon), so I thought I'd go all out. Depending on how quickly that knits up, I may also cast on for a hat for my brother for one of his holiday gifts. Thanks to Jen for the Blanche-Neige suggestions. I thought about e-mailing the designer to see if she could suggest an alternate yarn, but seeing as how her recommended yarn is her own -- well, somehow I'm guessing she wouldn't be so helpful. I'm still hoping that I can play with the gauge, especially since it's an open, cardigan-type garment that will be a little more forgiving if the gauge is slightly off. Or so I think. I'm probably going to put this project off for a bit, since I still have holiday gift knitting to do and I've been spending a lot of money lately. Then again, I'll have a lot of knitting time the last week of December when I'm off from work. Oh, the temptations! Still seeking imput, if anyone has any! Yes, the mystery project is, alas, no more. For one thing, I went ahead and told J what the project was -- a pair of socks -- since I'm apparently inept at turning a heel with double pointed needles. It just looked so bad that I gave up on the possibility of a blocking miracle and frogged the whole thing. I'm now back to square one, with a ball of pretty yarn. Yes, those are my brand new US 1 Addi Turbos, currently working on a test sock (for yours truly) in Knit Picks Sock Garden in Geranium. Behold my toe in all its merino deliciousness, mmmm. I love love LOVE this yarn. It's so soft and knits up so nicely on these needles. I think the two circular needles might solve some of the laddering issues I was having with the dpns, not to mention the fact that these are a size smaller than the dpns (they were US 2's) so the fabric should be a little tighter. I'm just going to finish this sock and see if I've figured out where I went wrong with the heel last time, and if all goes well, I'll cast on for J's socks once this one is bound off. It won't be a surprise, but I know he wanted a pair, so it wouldn't have been that big a deal even if I had managed to pull them off. 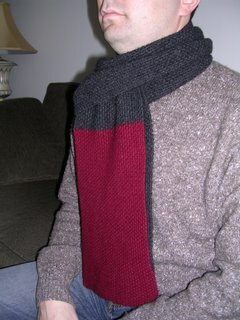 Speaking of J, I finally finished his scarf last week, and I tried to felt it. "Tried" is the operative word here; apparently my dpn/heel ineptitude (is that a word?) decided to extend itself to my felting abilities. I put the 6' scarf in the washing machine with three pairs of jeans on a normal wash cycle -- and 30 minutes later I had a 7' + table runner. Plus, the fabric just barely softened up a bit, didn't get anywhere close to felt. Grrr. I guess I'll have to schlep over to my parents' one evening and use their washing machine, since that's what did the trick for my felted bag. Here you see several of my UFOs. L-R are: baby cashmerino cabled scarf, Clappy, baby cardigan (sans buttons). Hiding under the paper in the back is a big ball of cotton blend yarn from a sweater I frogged a while back. Still contemplating yarn for Blanche-Neige. I think I may try Knit Picks merino style with a smaller needle (perhaps US 4's?) to try to get gauge. I think I figured out that if that will work, I'll probably be able to get the yarn for around $30 -- much more affordable than the 100% cashmere the pattern calls for! I am definitely forgoing the beading, however; I think the fuzzy black trim is enough embellishment. 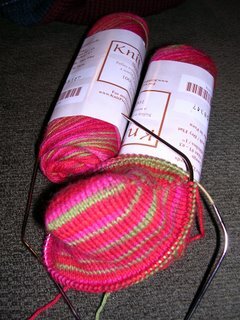 What do you think -- should I try to play around with gauge to save money on the yarn? Any tips on how to play with the pattern to make it work? Give me your imput, oh wise knitters! So the new Knitty is out (up? ), and I keep coming back to it. There are a lot of cute designs, especially the little animals/critters (they remind me of some Beanie Baby-sized animals I crocheted several years ago). Of all the designs, though, I'm positively taken with this, and I think it might have to be my next project for myself. I so cannot spend a fortune on 100% cashmere yarn, however, so I am thinking about what a good substitute might be (especially a substitute that is relatively cheap, since I will be buying a lot of it -- KnitPicks anyone?) I would like to formally solicit anyone's imput on this one. Also, I'm a little nervous about working with the pattern if I use another yarn, because I'm not sure I can get the same gauge. I haven't had enough pattern experience to know how to play with gauge and measurements and patterns and such, so I don't know what I would have to do edit the pattern to work with another yarn. My gut instinct is just to go for it and pretend I don't care, but I have a feeling that with a fitted garment like this, that just won't fly. Anyone out there really good with math? 1) J's scarf is just over 5 feet long, and I'm about to join the final skein of yarn to finish it. I'm planning to make it 72" so that when I felt it, it will still be long enough to wear it the European way (doubled over, wrapped around the neck, with the ends pulled through the loop in the middle), which is how J informs me he liked to wear his scarves. (I cannot confirm this, since I don't think I've ever seen him wear a scarf, but I'll just have to take his word for it.) I am planning on finishing it by the end of the week, and hoping to felt it this weekend. I promise to take before and after pictures, but I can only post them soon if J will promise not to peek. Of course, I might not trust him anyway and just wait until after the holidays to post them. 3) Clappy (my clapotis) is resting on her needles right now. I did a few more repeats of the straight rows last week, but have done nothing since. I'm about halfway done at this point, and starting to worry that I may be one skein short on yarn. I think I'm just overreacting as usual. 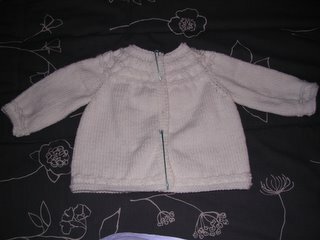 4) The yoked, top-down baby sweater I knit last weekend is still sitting on my couch, still awaiting buttons and blocking. I am going to try to dig through my button collection and see if I have five that (more or less) match; otherwise I'll need to make a trip to the craft store this weekend. Give me your thoughts on yarn and pattern-tweaking for Blanche-Neige! Hope everyone else had a productive knitting weekend like I did. I wound up not having to work for the first weekend in months (Saturday because they called me off, Sunday because I woke up sick). I thought that since I was on the couch anyway, I might as well put all this free time to good use. Faced with a weekend of plenty of knitting time (but since I was at J's the whole weekend, I couldn't work on knitting for him, obviously), I decided to tackle this. I decided it was high time I attempted to knit a sweater, but still feeling somewhat apprehensive, I thought my best bet was starting with a baby sweater -- small enough to not waste too much yarn, but it would still give me the idea of how it felt to knit a garment that's not a hat or scarf (which has been most of my knitting to date). I also thought this would be a good stash-busting project, since I've got so much icky acrylic yarn left over from several crocheted afghan projects I did last year. Still needs to be blocked and buttons need to be sewn on, but I'm thrilled with the results. And many, many thanks to Jen, who put up with my webstalking and helped me decipher the pattern! Even though this was knit with "icky" acrylic, I think it might still make a nice gift for my cousin, who is expecting a baby in February. Hey, it's machine washable, so the kid can get whatever he/she wants on it and it won't be ruined.